Whether we’re invested in where he’s going, however, is debatable. Doritos are a proud American innovation, one I consider at least the equal of jazz, baseball, and the modern federal constitutional republic. The sum total of the chip is inarguably delicious. But investigate further (if you dare) and what truly impresses about the Dorito is how it is actually a collection of small, smart tricks: There’s the eye-catching color, the appetite-sparking lacquer of salt and fat. The most interesting trick of all is an idea the New York Times — the nation’s leading authority on snack food — recently described as “vanishing caloric density.” This refers to a phenomenon in which the brain equates the feeling of fat “melting” in the mouth with the disappearance of calories — thus delaying the feeling of fullness. It’s not a sign of quality or hunger that you can eat an entire bag of Doritos in one sitting. It’s a triumph of design. House of Cards is the Doritos of contemporary television, and I say this with real respect. It was commissioned and micro-targeted by Netflix to hit as many of its data-rich demographics as possible: Chilly Political Nihilists, Fourth-Wall Breaking Stem-winders, Finger-Licking Morning Barbecue Aficionados, etc. It was packaged with A-list stars, polished with top-notch character actors, and burnished by the icy professionalism of director/executive producer David Fincher. It felt all-consuming and momentous, even if it didn’t quite add up to much. The model for its first 13 episodes, dumped all at once onto Netflix’s servers a year ago, wasn’t a standard season of television with its familiar beats, peaks, and valleys. Rather, it was the apocryphal pot of water with the frog swimming in it. Beau Willimon, the playwright who adapted the series from the highly lauded U.K. original, increased the heat so gradually that, by the time it was boiling over with backstabbing, frontstabbing, and outright murder, it was far too late for even the most skeptical viewer to escape. Tawdry and addictive, House of Cards was a series made to be devoured in private and in the dark. It was only in the cool light of morning that its relative lack of nutrition became apparent. Judging by its first four episodes, the second season of House of Cards, which arrived en masse last night, doesn’t mess with what turned out to be a successful recipe. If anything, it’s nacho cheesier. When last season ended, Congressman Frank Underwood (Kevin Spacey), our slithery lead, had been tapped to be the vice-president of the United States not by way of traditional electoral channels, but through a particularly vicious brand of politics that involved slashing all allies and burning all bridges. In the closing moments of the finale, Frank celebrated his cruel coup by taking his wife, Claire (Robin Wright), on a nighttime jog. Season 2 picks up not 10 minutes later, with the Underwoods still running. The message is clear: Frank is still very much midstride. Whether we’re invested in where he’s going, however, is debatable. Absolute power corrupts absolutely, but Frank is already rotten to the core. Without anything to counterbalance his venom or illuminate his craving, Frank’s quest for power can feel absolutely hollow. Last year, the congressman shared the spotlight with Peter Russo, a train wreck of a pol played with remarkable poignancy by Corey Stoll. The boozing, snorting Russo had an appetite as big as Frank’s, though he couldn’t help but point his fangs in the wrong direction; instead of a higher power, Russo sought higher office. It was hard not to feel sympathy for him as he struggled to stay afloat in the cesspool of modern D.C. But he was dog-paddling, whereas Frank, a born snakehead, had gills. When Frank stopped Russo’s heart, the already frosty House of Cards went cold right alongside him. In Season 2, Frank remains a sly and charismatic predator. The world around him, though, is increasingly populated with dead meat. Ensconced in the executive branch, his town house converted into a high-tech fortress, Vice-President Underwood is less a schemer than a bully, his victims an uninspiring stew of career politicians and other assorted pushovers. (It doesn’t help that Michael Gill is back to play a president so lacking in charisma, he couldn’t be elected to a co-op board. “The president is like a lone tree in an empty field,” Frank hisses portentously. But what he really means is that he’s wooden.) Gerald McRaney has an increased role as an influential adviser; Jimmi Simpson shows up as a preposterous hacker. More welcome is the arrival of the excellent Molly Parker (Deadwood) as a congresswoman learning to play hardball and the return of the muckraking troika of reporters (Kate Mara, Constance Zimmer, Sebastian Arcelus) on the hunt for the truth and, if possible, Frank’s scalp. (It’s a pity Willimon gives increased screen time to the member of the trio who deserves it least.) 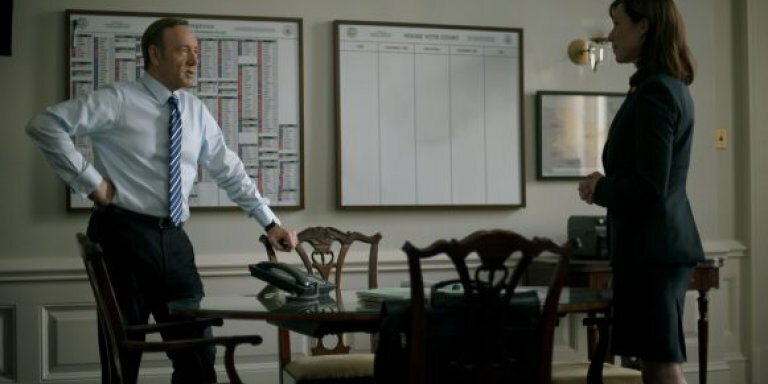 Regardless, House of Cards is now totally the Underwoods’ show, its story little more than a vicious ticktock of their cynical, calculating knife fight to the top. The effect is impressive, but relentless. It’s The Walking Dead told from the perspective of the zombies. But House of Cards isn’t meant to be dissected. It’s meant to be binged on. And it’s a temptation to which I’m not immune. I didn’t stop watching after the fourth (and best) episode out of any critical objection. I stopped because my supply of advance screeners ran out. (Now that the entire season is available, I’ll check back in soon.) Over the next few nights, as we’re hitting play again and again, I have a feeling we won’t be noticing the show’s little inconsistencies and aggravations accumulating like so much orange dust on our fingers, or mind the throbbing in our heads where our consciences used to be. It’s been my experience that snacking never really adds up to a meal and that gluttony usually leads only to regret. But I’d be happy to be proved wrong by the next batch of episodes. House of Cards is plenty filling. But is it satisfying? We’ll know soon enough.